– Review TBD. A tutorial offering basic play through card counting. Two versions are available: The basic version (game) and the Pro player version. – Review TBD. This game package includes excellent graphics and sound for blackjack, craps, video poker, roulette and slots. Blackjack portion includes card counting features and supports one to four players. Includes a companion strategy book written specifically for this software by Avery Cardoza. – Good. Recommended. Performs simulations and allows interactions. In the interactive mode, up to four players are allowed. The main value of Omega II is for simulations which it can do at about 10,500 hands per hour. A copy of this software is available free (less postage) when you buy Carlson’s Blackjack For Blood book. – Excellent. Highly recommended. This outstanding simulation software was originally based on John Immings RWC 4.3 engine which sold for $179. Lots of rule variations, balanced or unbalanced, etc. Fast, powerful blackjack simulation and training software. Allows 1 to 7 players, each playing any strategy, betting system, and count (balanced, unbalanced, or suit-based) desired. Choose from 40 different rules variations and 18 real-world shuffle routines to create virtually any set of casino rules and customs imaginable. Further select from five different simulation modes to generate and record a wide range of invaluable statistical information. Also features a powerful game-play mode, and an automated flash-card drill designed to sharpen your counting skills. Includes a comprehensive 51-page users’ manual. Requires 640K RAM, MS-DOS 5.0 or higher. Windows 3.1, 95 and 98 compatible. Bryce Carlson is the author of the book Blackjack For Blood. – Excellent. Highly Recommended. Based on Arnold Snyder’s Algebraic Approximation Method this simple program will generate true count strategy charts for any balanced count. You input the count values, number of decks, etc., and it generates charts for both soft 17 rules, double down charts, pair split charts, and the insurance index. The program also calculates the playing efficiency, betting and insurance correlation. – Very good. Recommended. For players interested in learning the Zen count. Arnold Snyder wrote the 39-page user’s manual. – Review TBD. Includes basic strategy, the Canfield counting systems and limited to head-up play. – Review TBD. According to the advertising, “…is a full featured blackjack game loaded with options that let you simulate virtually any casino. Animations, a genuine blackjack dealer’s voice, keyboard shortcuts, over 80 different card back images, king and queen faces include leaders from many different countries, and blackjack variations offer a realistic blackjack game for both novices and pros. Play the popular blackjack variations of Spanish 21, Super Sevens, Double Exposure, Over Under 13, European Blackjack and the blackjack wheel. The software also has the ability to input card counting systems. – Review TBD. Written for the programmable Texas Instruments TI-59 calculator. John Eaton has spent 10 years in casino surveillance – 8 of those years at the Dunes. Public domain software. ET Fan. See PowerSim below. – Not recommended. Real world simulation software that supposedly takes into account everything from the wash to the actual shuffle. Comes in several editions — Party, Gambler’s, Student, Advanced, PBJ/Clump Trackers, and Professional. Since the author appears to be convinced that clump tracking and TARGET are valid approaches to winning at this game I am not recommending this. The software appears intriguing, however, I have not evaluated it. – Good. Recommended. This applet is expressly designed for card counters to investigate different counting systems, specifically with regard to betting efficiency in a standard single or multiple deck game, like the kind that can be found in Las Vegas. On all hands, appropriate Basic Strategy is followed for the play of the hand. For single deck games, there is no DAS. On Multiple deck games, DAS is automatically implemented. You may choose to hit or stand for the dealer on soft 17. The only variation in play is variation of the wager, that is, the spread, and this is handled automatically by the program. – Review TBD. These applets are designed to settle arguments that sometimes arise as to the soundness of progression betting schemes. We feel such systems are essentially equivalent to Basic Strategy, with (usually) a much higher probability of Ruin. – Review TBD. A practice program also written for the TI-59 calculator. Public domain software. – Very good to excellent (depending on what version you get). Highly recommended. This software has made the circuit as shareware software for several years. Includes excellent VGA graphics that require a VGA monitor. The shareware version supports up to 4 casinos, 1-8 decks, resplitting, DAS, hit split aces, double any or 9,10,11, double on more than 2 cards, insurance, surrender, and H-17 or S-17. Includes an excellent basic strategy and card-counting drill. Supports manual or auto deal, single or double deal. You can set up betting progressions and it has a unique tournament strategy mode where you can set up the number of hands in a round. The commercial version includes the Red Seven count but you can input any single parameter system into memory along with strategy tables. Commercial version includes 40-page manual. – Excellent. Highly Recommended. Arnold Snyder calls this software the “Theory of Blackjack” on disk, and the author writes that an, “…especially enjoyable use of Blackjack Subsets, and part of the reason that it was written, is as a companion in the study of Peter Griffin’s Theory of Blackjack.” The purpose of the software is to derive expectations, effects of removal, and optimal linear strategies based on effects of removal tables. Multiple player hands are allowed. – Excellent. Highly recommended at the time. Useful for learning any counting system whether balanced or unbalanced and by true or running count. Use strategy and betting tables you develop. Over 43 rule variations, including Over/Under 13 and double exposure. Use a 5, 6 or 7-spot table and play from 1 to 7 hands. The program will display errors and mistakes as you make them. Use any set of rules and number of decks. Practice your card counting system using generic indexes, 2, 3 or 4 card indexes or special cases. Over 100 casinos predefined with rules and setup. Perform simulations of systems of over 20000 hands/hour, however, this version was not designed to be a high-speed analyzer. – Excellent. Highly recommended at the time. Included RWC #1. Does everything #1 does and allows you to perform higher speed simulations from 6 million hands per day to over 30 million hands per hour, depending on the number of players at the table and the speed of your PC. Analyze side counts for ace adjust. The Analyzer will print out or store to disk several pages of data for each run including data at each count. You can also run analyses of odd deck subsets. – Excellent. Highly recommended at the time. Included RWC #1 and #2. Perform your own blackjack analyses of basic strategies, card counting, betting progressions and non-random (real world) shuffles. Many of the probabilities and strategies in this book were originally verified using this software. This program will generate strategy tables for any count (balanced and unbalanced) and set of rules you choose. Version 4 includes the ability to program a variety of real-world shuffles. Version 5 included macro programming capability and had over 50 major casinos pre-programmed with rules. Version 6 included over 100 casinos predefined with rules. Use Kelly or other criteria and generate data at a specific penetration. Included a high speed simulation mode providing up to 12 million hands/hour. Last known version allowed you to run cover play analysis. Be forewarned, this program is not recommended for beginners and requires a great deal of time to learn. See Real World Casino: Multiparameter Blackjack Engine. – At time of writing, this software was in the development stage. Imming had sent me a preliminary version which was very impressive. An announcement was expected in the Dec 93 issue of Blackjack Forum, however, there was word that John Imming had died before he could complete this project. In the book Modern Blackjack, by Norm Wattenberger, we learn that Imming’s death was a rumor and that he was no longer working on blackjack software. Very strange and sad. – Designed to teach basic strategy, the Hi-Opt I and to provide visual and card counting skills. Includes a 21-page manual. – You vary the clump size, your bet spread, and how rich the clump is, and this applet predicts your edge over the house using basic strategy. This applet is expressly designed for shuffle trackers to investigate their real advantage in practical play. The game being simulated is the kind that can be found in Las Vegas (no RSA, hit soft 17, etc.). On all hands, Basic Strategy is followed for the play of the hand. Hi-Lo strategy is used to count the deck and the clumps. For single deck games, there is no DAS. On Multiple deck games, DAS is automatically implemented..
– Outstanding. Recommended. SBA Standard Edition was a powerful and extremely fast blackjack simulator that provides all statistics for each true count. SBA supported almost all reasonable rules, all counting systems, supports wonging and back-counting, and supports sophisticated cover betting. SBA allowed you to calculate optimal bets for each true count. Independently rated the best blackjack simulator available at the time. SBA Advanced Edition – The advanced edition added a precise and super fast playing strategy generator. Generated all playing indices for any counting system and almost all rules combinations. The strategy generator played at the speed of two billion pairs of hands per hour on Pentiums. Reviewed in the Spring 1997 Blackjack Review issue 6.2. This was the best blackjack simulation software on the market at the time. Appears that no work has been done on this software since version 5.5. [ sba21.com/ ] – Appears SBA is not for sale anymore! – A simple public domain program for the IBM PC. Includes hit, stand, double down, split options with insurance. Public domain software. – Excellent. Recommended. Arnold Snyder calls this, “…the best all-around blackjack software deal on the market.” Excellent graphics for practice, simulations and creating strategy indices. Up to 7 spots can be set up on the layout or you can use a Multi-Action setup with any card-counting system (balanced or unbalanced). For the price, this was great software. – Excellent. Recommended. This free software, available on the BlackjackInfo.com site lets you do accurate analysis of any set of rules of blackjack. It provides optimal strategies, expected value of every decision, and more. – Review TBD. Blackjack Plus lets you play computer blackjack with total control over casino rules and with instant readout of the probabilities associated with each playing choice. You select the number of decks, rules for splits and double down, payoffs, and more, then get a total picture of recommended player strategy for every card situation. Shareware software. – Excellent. Highly recommended. Subtitled: Blackjack Master Course Software for Windows. One of the most unique blackjack training software on the market today since it will improve your card counting skills. Includes drills to improve counting, true count conversion, deck estimation, play variations, count indices, etc. Use the built in count or create your own balanced or unbalanced count. Newer versions now include the companion Practicum “play” upgrade. Excellent graphics and includes several unique practice and analysis features. Pronovost, Dan. See DeepNet Technologies below. – Very good. Recommended. This was completely new Windows software that was supposed to bring Stanford Wong’s Blackjack Count Analyzer up to Windows performance. PBA is a comprehensive software tool for the analysis, simulation, and practice of the game of blackjack. While PBA has some of the most sophisticated options available, including custom shuffle specification and pattern/progression betting, the intuitive user interface makes PBA easy to configure and operate. Choose from all standard and numerous exotic rules; select any true- or running-count based system; select a betting scheme based on the running or true count, patterns of wins/losses, or both. Then use PBA to calculate the optimal strategy and expected profit, and practice using PBA’s feature-filled game module. PBA is a Learning Aid for the game of blackjack, including card counting and betting strategies. Play it as a game, with feedback on playing accuracy, betting accuracy, counting accuracy, and playing speed. PBA is a Research Tool. Select from a wide range of rules, then calculate count strategy numbers in seconds and run high-speed simulations. – Review TBD. Blackjack simulator and analysis tools. Includes the BJT Program which performs blackjack simulations using the pickup order that casinos actually use and non-random shuffles. – Very Good. Recommended. From the instruction manual: “Blackjack PowerSim is a fast Windows blackjack simulator with executable program and support files, including source code, freely available courtesy of blackjackforumonline and ET Fan.” This software was available for free on Arnold Snyder’s site. It was written in XBasic and is considered open source software. – Excellent. Highly recommended. Shuffle Trak software allows you to define, map, and practice playing using casino shuffle routines. The user can specify dealer grab sizes, penetration, riffle type, stack, zone, plugging, etc. The automatic simulation feature allows you to watch the card flow patterns (using color graphics) with up to 7 players at the table, as the mapping screen follows the action of the game. If you are interested in shuffle tracking be sure to get Arnold Snyder’s 3-issue Blackjack Forum shuffle tracking series also. Highly recommended for advanced players who have mastered card counting and are interested in shuffle tracking. At the time, this was the only software on the market that could map virtually all known shuffles used in casinos today. – A BASIC program and originally written for the TRS-80 computer. This program was designed for the development, study and analysis of blackjack playing strategies and betting systems. – Recommended. Provided risk analyses similar to John Auston’s Blackjack Risk Manager (BJRM) software. A simple yet powerful blackjack program which transforms user-input statistical data into accurate, precise, and useful output data. To quickly analyze results from blackjack simulations, the user enters data for each count value, and at the touch of a button essential information is displayed. Included in the output is Kelly optimal bet sizing, dependent on the user’s risk-tolerance and bankroll size, hourly expected value and standard deviation dependent on rounds observed/played per hour, risk of ruin, desirability indices, short-term (trip) statistics, and more. By changing input variables, the user can create a playing system, a short-term analysis, save and open data files, and print the results to accompany its respective simulation report for quick reference. – Very good. Recommended. Practice program specially designed for the Knock-Out Blackjack counting system. CVBASIC. Free practice software for blackjack basic strategy. CVBJ. Practice play and drills. CVBJ-Lite. Practice play and drills. CVBlueprint. Practice play and drills and companion software to Blackjack Blueprint by Rick Blaine. Half the features of CVBJ. CVDATA. Advanced simulations and strategy construction. CVCX. High speed simulations and calculators. – Excellent. Highly recommended. One of the best software programs at the time for teaching yourself how to count cards… and available on the Mac. Basic strategy, card counting strategies and high-speed simulations. Includes the Expert, Hi-Lo, Hi-Opt I, Red Seven and Zen counting system built in or you can create your own. Two excellent drill modes were supported. Ran simulations over 200,000 hands/hour on a MAC IIci. Version 2.0.2 tested. Appears to no longer be available. -Excellent. Highly Recommended. Blackjack Vision can simulate ALL 7 seating positions up to 4 billion blackjack rounds at speeds up to 100 million hands per hour(Pentium 150; heads-up). All major U.S. rules and count systems are supported. Simulation data can be instantly updated by changing betting parameters. It can also determine risk of ruin for any bankroll. Advanced features include multi-parameter systems, Multiple Strategy Tables, and secondary counts. Over 150 stats are recorded: count freq.distribution in numeric & VGA graph form, count,ins.,& play advantages, much more. Context Help is available for beginners. Includes a 4 player VGA practice mode with easy to read cards. – Very good. Recommended. This software provided the casino (or player) edge off the top of the deck or shoe based on rule variations selected by the user. Supported 1-8 dks, conventional and double exposure. At one time, this was one of my favorite programs. – Excellent. Highly recommended. This software allows the user to instantly create basic strategy charts for most rules and options available today including double exposure. You can also run high speed simulations to determine exactly what they are worth to you. The following rare rule options were listed in the version tested: 5-card hand, 6-card hand, 7-card hand, 6,7,8 all spades, 6,7,8 same suit, 6,7,8 mixed suit, 7,7,7 all spades, 7,7,7 same suit, 7,7,7 mixed suit, 5,5,5,5 all red, A,J both spades, A,J same suit, Natural both spades, and Bust box. This software also has an excellent game/training mode that you can use to play blackjack and perfect your skill at blackjack. Player errors are indicated along with the correct play and percent difference. – Excellent. Highly recommended. Incorporates everything that Blackjack Analyzer has and adds card counting features. You can print out the indices of any balanced card counting system available today. You can also run high speed simulations but side counting of aces is not supported. Provides excellent simulation data on the screen including payback, standard error, variance and covariance for flat bets and user bets. Also included is the standard deviation per 100 bets and the average bet. – Good. Recommended. Conventional, double exposure and European rules used. Program counts cards using any counting system and gives the player his expectation for every possible way to play. Expectation is based on the exact mix of cards remaining. Usable as an aid to learn how to count cards. – Excellent. Recommended. At the time this was the only software on the market that allowed players to simulate and analyze blackjack tournaments. Set up almost any tournament format and set any or all players on manual or automatic. This was the perfect companion to Stanford Wong’s Casino Tournament Strategy book. – Good. Recommended. Develops frequency distributions for any count system in any game with any number of decks, any number of players, and any shuffle-point. It estimates your standard deviation and risk of ruin with any betting system and will calculate your expectation in any game using the Blackjack Formula by Arnold Snyder. or practice before entering a real casino or anywhere else. Unlike similar programs, it doesn’t use any charts, tables, or counting systems. Instead, it calculates the best move you can make according to the cards still in the deck. It also recommends the amount of money you should bet on each hand. Options let you select the number of decks, set rules for splits and double down, set table rules, use European rules, and more. 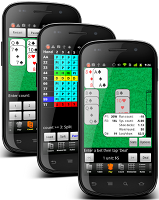 The unregistered version limits the dealer to starting with a 5, 6, 7, or 8 card.” It appears the software that was once available on Palm devices is now available under Windows in two versions. Blackjack Pro 2021 allows you to play the game where as the Analyzer version allows you to analyze hands. – Good. Recommended. A good training aid with exercise options for basic strategy, counting, and game playing. Uses Revere’s strategy tables. Arctic House. Blackjack Card Recorder. (WIN 95/98/NT). – Review TBD. Software allows recording of cards during a blackjack game. User can define the number of decks. Thus a single deck or multi-deck game is possible. User can select from three pre-defined counting methods. The three methods are widely known Hi-Lo, Hi-Opt-1 and Zen-Count. Furthermore user can define his/her own counting method easily from SETUP. The Recorder window stays on top of the blackjack windows all the time. Both the running count and the true count are shown. – Review TBD. Free web-based drills that will help you master basic strategy, card counting, true count conversion, playing deviations and includes a full game to practice your skills. Pay extra for access to premium drills. – Review TBD. Teaches basic strategy, counting, true count conversion, deviations and let you practice implementing a bet spread. – Review TBD. Keep track of every second you play and every penny you win. Keeps average $/hr as well, charts your progress, and includes a printable results sheet to carry to casinos with you. – Review TBD. Keep track of sessions, players, and investors for a team of 2 to 100. Account for money being transferred between players and keep track of how much each player should have at any given moment. – Review TBD. In addition to the typical Play Mode this program has a Tutor Mode. The player selects the type of dealer he wishes to learn against and a “table search” is performed to load in the proper strategy to be taught. Borderline decisions are indicated. – Review TBD. Includes five casino games: blackjack, baccarat, craps, roulette and video poker. The blackjack portion is called Blackjack Ace. – Review TBD. Supports up to 4 players. Includes a card count display/window. Simulate up to 37,000 hands per hour. – Excellent. Recommended. SmartCards provides one of the best card counting training tools available anywhere. It is not a home blackjack game, but a professional software tool that builds the skills you need to beat the game consistently. SmartCards does this by providing a large range of exercises and practice environments. It supports virtually any card counting system, with features not found in many other practice programs. – Good. Recommended for play only. The AMIGA version has excellent graphics, is mouse driven and easy to play. Supports up to 5 players and allows user to change some rules. Includes surrender option. The version I tested had a few bugs but it is fine as a game only. Version tested pays off a ten and ace after splitting aces at 3 to 2 which is incorrect. – Very good. Highly recommended. 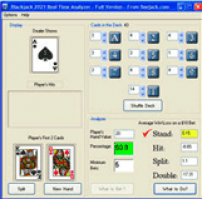 Allows you to practice card counting, set-up options and analyze up to 1,000,000 hands. Provides a special segment of the 102 hands most likely to give you trouble. Includes 86 page book. Version reviewed used only the Hi-Lo count. Available for DOS and Windows 3.0 or higher. – Good. Recommended. Includes complete strategies for basic single deck and multiple deck play. All strategies developed by J. Braun. Manual (86 pages) explains the game and strategies. Includes a card count flash training aid. Player and dealer odds calculated with each card dealt. – Review TBD. In addition to a single deck blackjack game, this software includes craps, video poker, baccarat, and mechanical horse racing. – Review TBD. A training program for card counters. Supports 0 to 6 players and 1-8 decks. Queen of Cards. Learning Winning Blackjack. Phoenix, AZ; c1980. ??? – Review TBD. According to John Eaton (see public domain software below) this program is believed to have been rewritten from the original Ken Uston’s Blackjack software. – Review TBD. Simulates most house rules and game variations. Includes card counting exercises. – Review TBD. Practice software. – Good. Recommended as a basic strategy training aid. Future version promises to include card counting strategies. – Review TBD. Seen advertised in Blackjack Forum. Use 1 to 8 decks. Rule and penetration variations. You input your card values. Displays true and running counts, simulates multiple players at table. – Review TBD. Seen reviewed in Blackjack Confidential. Reports to have a good tournament blackjack playing mode. Includes Braun’s Hi-Lo strategy. Play with up to 6 computer or live players, single or multi-deck up to 8 decks. Includes drill and practice sessions. – Not recommended. This program allows up to six positions that can be played by the player or the computer. Playing and betting styles are programmable to fixed, random, progressive or card-count (Hi-Lo) based. Online rules and tutor available. Attractive but too many restrictions. – Review TBD. Includes video poker, video slots, blackjack and table roulette. Blackjack game allows you to use only one deck and you can bet between 1 to 5 “credits.” Splitting pairs, insurance, doubling and surrender supported. – Not recommended. One of those first of its kind software products for the Microsoft Windows environment. 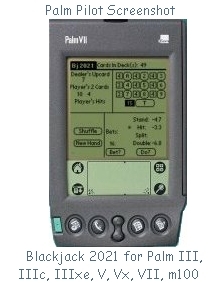 Includes pull down menus, VGA graphics, sound blaster support and the ability to play one of four hands or have the computer play them all. Screen displays the count (your input) and odds of player or dealer making 17 or busting. Playing strategies may be modified. Includes card counting drill with one card displayed on screen (3 sec to 1/10 sec per card). Includes 57-page manual with questionable advice on zero proximity betting, card clumping and table selection. – Review TBD. Use running or true counts and install card counting values and strategy tables for each of 1 to 6 positions. Thus, you can test different systems against each other. Tutor Mode can be used at any position when you play it yourself. In Card Sharp Mode you can practice or research particular kinds of hands (e.g., only soft hands or hands in a given range). Provides 4 kinds of reports on any system or on your personal play. – Good. Recommended. A good card counting practice program most useful to single deck players. _______. Blackjack Counter Attack. (IBM) ??? – Review TBD. A training program for card counters by the same company that developed Blackjack Conquest. ______. Blackjack Tutor. c1980’s (IBM, APPLE II, C64, TRS-80?) Available through Jerry Patterson. – Review TBD. A program for card counters. Includes the hi-lo card counting system. – Review TBD. A blackjack trainer and simulation package. Includes support for all rules, comprehensive statistics, interactive help, in-build graphing and its own unique fully programmable betting strategy language. It comes pre-configured to run ‘Las Vegas’ rules, but any other rules set-up may be loaded or using the built in configuration features, you can set-up any casino table conditions you like. During play up to Seven table positions may be played, with each position being played either manually or automatically. Table positions that play automatically, can be configured to play in any style. – Review TBD. First seen in an Ebay auction listing. Appears to be software that resembles many of the video blackjack machines available. – Good. Recommended. From Belgium??? Seen reviewed in Blackjack Forum. Arnold Snyder gave this a great review: “This program is incredible. WinBJ uses the statistical analysis methods proposed by Peter Griffin...”. Open Directory Project Blackjack Software1)As of March 17, 2017, dmoz.org is no longer available. A static mirror is available here. 1. ↑ As of March 17, 2017, dmoz.org is no longer available. A static mirror is available here.